We are proud to share our Student Handbook online. The Student Handbook information overall pertains to the current school year. Should there be a change or addition to a particular year's information, an addendum will be sent out to Parents by email and hardcopy. The affected information will be updated online also. D. Grades 1-6: at the loss of 10 points in a student’s conduct grade, students will serve 1 detention. Each additional 10 points equal another detention. How to use your web browser's FIND feature to search this page. Immaculate Conception School is a Catholic institution committed to the teaching of Catholic Christian doctrine and values and is dedicated to providing a quality academic and enriching program. We recognize the rights of individuals as children of God deserving honor and respect, and work toward the following goals and objectives with the involvement and cooperation of the students’ parents or guardians. To provide our students with a well-rounded academic program with Catholic fundamentals as its core. To establish a community of faith with students, teachers, administrators, support staff and parents, and to spread this environment to the surrounding local community. To promote unity, love, respect and understanding among all people regardless of race, religion or socio-economic group. The great truths of Catholic faith must be taught in the home by parents–first by example, then by precept. According to the age-old teaching of the Roman Catholic Church, parents are the first educators of their children in the ways of Faith and commit themselves to the fulfillment of that role on the day of each child’s baptism. This is no light commitment, and the Catholic Church and School System serve simply as necessary support for and supplementation of the good work already taking place in the home. Therefore, family prayer and religious practice must be emphasized, for these are the most enduring ways to develop a consciousness in children of the abiding presence of God. Similarly, in order to be in true compliance with the Third Commandment of God, every Catholic is to be present for the Sunday Mass each weekend. Attendance at a weekday Mass in no way fulfills this obligation. Therefore, any student whose parents deprive him/her of the Sunday Mass commit a serious sin against themselves and against their own children and give poor example of adult commitment and responsibility. Certainly, such a message does nothing to instill within the young person a desire to pattern his/her life according to the will of God and only teaches that one’s own personal will is superior to the will of the Almighty. Any individual having contact with or responsibility for children at IC School are mandated by law to report any suspected child abuse or neglect. Suspected abuse or neglect must be reported immediately to the principal, and the Department of Human Services or SCAN must be called. The reporter should not attempt to substantiate or investigate the suspected nor should he or she contact the child’s parent(s) unless requested to do so by investigative agencies. Any person required to report suspected child abuse who willfully fails to do so is subject to a fine and jail sentence as well as being civilly liable. Any person working in any capacity with children of Immaculate Conception School (including volunteers)* must read the diocesan policy regarding the Sexual Abuse or Sexual Exploitation of children by church personnel. The policy is available to read in the school office. You must then sign a form, also available in the school office, stating that you have read and understood the policy before you will be allowed to work or volunteer in the church or school. If we already have your signed form on file, you do not have to fill out another one. Any person working in any capacity with children of Immaculate Conception School (including volunteers)* must also complete the CMGConnect:Safe Environment online training, submit to a background check through the diocese. * A regular volunteer or employee is any person who functions in the name of the Church in the capacity of chaperoning, mentoring, supervising, teaching, or training minors (those 17 years of age or younger). Positions may include: athletic director, catechist, chaperone for any field trips, clerical/office help, crossing guard, custodian (school or parish), daycare worker, instructional assistant, library assistant, maintenance (school or parish), playground monitor, room mother or father, sacramental preparation instructor, scout volunteer, server trainer/sacristan, tutor/private instructor, youth choir director, youth minister commission member, youth ministry activities chaperone, youth program leader, youth ministry retreat team member, as well as any other positions deemed to have any type of contact with minors. All adult volunteers who interact with students in any form (parties, coaching, field trips, etc.) must complete CMGConnect:Save Environment online training. Compliance with CMGConnect:Safe Environment requirements will be checked 2 weeks prior to all events/activities. Here at IC we firmly believe that the parents are first and foremost the primary educators of their children. In support of this belief it is absolutely essential that parents, school staff, and administration support each other. In order to communicate the importance of this point, IC has developed the following policy for all students, parents, school staff, and administration. When posting to social networks, please be ever vigilant in maintaining professionalism. Vulgar or unchristian-like postings or photos will not be tolerate at any time. Remember, we are all representatives of IC School whether we are at school, school-sanctioned events, at home, out in the community or at any other time. Be mindful of sending inappropriate messages or information critical of other parents, students, school faculty, and/or the school itself. Social networking sites are not the appropriate arenas for airing complaints. Please follow the Line of Authority as outlined in the IC Handbook. Thank you for the privilege of educating your children and for your support of IC School. I give permission to Immaculate Conception Catholic School to photograph my child/children. Furthermore, I agree to let Immaculate Conception School use photos that include my child/children in school related online and offline publication (e.g. yearbooks, newsletters, brochures, advertisements, school website, social media, etc.). I understand that my child/children will not be identified by his/her full name if a photo of him/her, outside of the yearbook, should be used unless parent is notified and consensual. The school name and logos may not be used on any physical or electronic materials without the express written permission of the Principal. IC School admits students of both sexes of any race, color, nationality, religion, or ethnic origin. New students entering IC will be on academic and disciplinary probation for a period of 9 weeks. After 9 weeks, an evaluation will be made. A Baptismal Certificate and a Birth Certificate must be presented at the time of registration. Arkansas Law requires all pupils entering school to have been successfully vaccinated. For a list of current required Arkansas vaccinations go to www.healthy.arkansas.gov and click on immunization schedule. If you have any further questions, please feel free to call the school office at 835-0771. In compliance with diocesan regulations, “No child shall be admitted to first grade unless he has attained the age of six (6) years on or before September 1 of such school year.” No child shall be admitted to kindergarten unless he has attained the age of five (5) years on or before September 1 of such school year. When a family is moving or withdrawing from school for any reason, the parents must submit a letter to the principal stating the reason for leaving and the planned date of departure. The same procedure should be used if the family is not returning for the next school year. All financial obligations will need to be fulfilled before any student records will be processed and/or forwarded to parents and/or new school. Also any textbooks, Library books, athletic/club uniforms, propety of IC School, etc will need to turned into IC before student records will be processed. Due to the professional qualifications of all teachers at Immaculate Conception School, parental request for a specific teacher will not be granted. If the parent feels the need to discuss special learning differences of his or her child prior to the class placement, the need must be put in writing and an appointment made with the principal to discuss an educational plan for the upcoming year. The letter and appointment must be completed before the end of April. At Immaculate Conception School, we believe the education of a student is a partnership between the parents and the school. We make every effort to accommodate or modify for identified special needs. However, our school does not offer a special education program. Children with exceptional needs requiring special class placement are to be accepted if their needs can be adequately met in the school. Initial enrollment should be on a tentative basis with the understanding that in the event the placement proves unsatisfactory, the parents will agree to enroll their child in another school system which provides for the special needs of exceptional children. The severity and degree of the disability. The level of support from special services or any special equipment the student may require. The number of students with disabilities currently enrolled in an assigned class. The school’s resources such as available support personnel, class size, accessibility of facilities, specialized teaching materials, and technological support. If it comes to the attention of the school that a student is in further need of special services, a conference will be held with the administration and the student’s teachers to address those needs. Evaluation by a diagnostician will be scheduled within two weeks and modifications will be made. Reevaluation of an identified student will be completed every three years. Modifications will be reviewed mid-quarter or as needed to insure adequate progress. If potential special needs are identified while at Immaculate Conception School and those needs cannot be met, the school will assist in providing referrals to the local school district or a private diagnostician. Modifications utilized will be noted on permanent record cards. Modified classwork, such as reduced assignments and tests. The employment of an adult aide for the individual student, to be paid for by the student’s parents or guardian. This adult aide may not be a family member and must be approved by the administration. The adult aide is required to be in place with the student within two weeks of the modification made by the administration. Immaculate Conception Catholic School endeavors to accommodate students with special needs, as the school’s resources and capabilities reasonably permit. Immaculate Conception Catholic School reserves the right to decline admission or impose reasonable conditions of attendance where indicated under the circumstances. Just as the parent has the right to withdraw a child if they desire, the school administration reserves the right to require the withdrawal of a student if they determine that the student could be served better elsewhere. This school abides by the provisions of the Buckley Amendment with respect to the rights of non-custodial parents. In the absence of a court order to the contrary, a school will provide the non-custodial parent with reasonable access to academic records and other necessary school information regarding his or her child. If there is a court order specifying that there is to be no information given, it is the custodial parent’s responsibility to provide the school with a court-certified copy of the court order. Preschool & Kindergarten registration for the subsequent school term generally begins in January; a non-refundable application and registration fee MUST be paid at the time of application. Current student registration for the subsequent school year generally begins in the spring; a non-refundable registration fee is due at the time of pre-registration. Student records from the previous school should be accessible for review by the principal. Reference letter from prior school should be available upon request. Please note that administration at previous school will be contacted upon application at IC School. Parents must select a tuition and fee payment schedule prior to any student beginning classes. Tuition for the elementary school is an annual fee based on number of children in the family and membership in the Catholic Faith. Tuition for the pre-school is an annual fee based on the number of days per week a student attends and is per student. Tuition may be paid annually, semi-annually or monthly through FACTS tuition management. Monthly payment dates are set in FACTS. The annual tuition rate is divided into 10 payments, the first payment due in August and the last payment due in May. The Facility Fee is a one time only, per family fee, assessed when the first student in a family enters Immaculate Conception Elementary School. All subsequent students from the same family are not assessed this fee. Facility Fees are NOT prorated. Facility Fees may be paid annually, semi-annually or monthly through FACTS tuition management. Monthly payment dates are set in FACTS. The Facility fee may be added in with the annual tuition rate that is divided into 10 payments, the first payment due in August and the last payment due in May. Resources Fees are due in mid-July. All credit card transactions (payments and refunds) incur a processing fee. The parish has limited funds available for aid with tuition. Eligibility is reassessed each school year. Eligibility is determined by FACTS Grand and Aid program and that family is a tithing IC parishioner. Families receiving scholarship monies from outside programs are required to present program arrangement with principal at application submittal. All families receiving scholarship monies will be responsible for all school fees not covered by the scholarship monies including but not limited to; books, application fee, registration fee, athletics, PTO fee, school activity fees, cafeteria fee, and Extended Care. All pre-registration and enrollment fees due at time of acceptance are non-refundable if your decision is to attend another school in the area. All fees will be refunded prior to the start of the school year if your family is moving out of the area. For families that move during the school year, a $300 withdrawal fee will be assessed. A statement of account will be issued for payment due. Statement of balance due must be satisfied within fifteen (15) days of notice. Denial of further classroom attendance when an unpaid account is past due. The family will be removed from the school. Any outstanding balance not paid by the last day of the school year (e.g., lunch fees, after/before school care fees, tuition, facility fees, resource fees, or Fair Share Hours Program fees) will result in the family losing their guaranteed placement in the school for the next term and report cards will be withheld. Eighth grade students’ report cards will be withheld and their records will not be forwarded to the high school if a past-due balance exists. Any credits toward lunch or Extended Care under $20 remaining at the end of the school year will be refunded upon written request. Immaculate Conception assesses a $10.00 fee on all returned automatic drafts each time they are returned up to a maximum of twice. Additionally, FACTS imposes separate charges for insufficient funds. After the second return the parent will be required to bring in cash in the amount of the tuition and/or facility fee payment and the late fees within 15 days. Two insufficient returns in a school year will require that the remaining balance of the school year's tuition obligation become due and payable immediately, in cash. Textbooks are issued on a rental basis and must be checked in at the end of the school term or before withdrawal. Lost or damaged books shall be replaced at full cost before nine week grades can be released. All students are required to cover books and carry them in a book bag/backpack. Consumable workbooks, resource fees, and classroom materials must be paid at or before the August start date. Any debt incurred by an eighth grader to the school must be paid before graduation. Failure to do so will result in that student not participating in graduation exercises. School day begins at 7:50 a.m. and ends at 3:10 p.m. School Office doors open at 7:30. All students should leave the school promptly after dismissal at 3:10. Students awaiting parents ARE NOT allowed to use the playground equipment, but should wait in a place designated by the school administration or use the after school service. Children not picked up by 3:25 p.m. will be escorted to the After School Program and a fee assessed. Parents should not be in the hallways before school begins or at dismissal. Each class has its own individual schedule that includes academics, lunch, recess, and religion. K-8 attended Mass at least once a week. Preschool students attend Mass on an rotating schedule. Arkansas law prohibits use of handheld wireless devices while operating a motor vehicle in a school zone when students are present. For the safety of our children and staff, please refrain from the use of all wireless devices during arrival and dismissal. The school assumes responsibility for the supervision of the student no longer than thirty-five (35) minutes before school and fifteen (15) minutes after the regularly scheduled school time. Sponsors of after school activities will not supervise siblings of participants. Siblings are to be picked up by parent or sent to after-school care. Students are to go directly to their dismissal area promptly after school dismissal. Students have designated dismissal areas based on their age, carpool, enrollment in After School Care or club. NO child can stay unattended on the school grounds after 3:25. Children who are not picked up by a parent or guardian by 3:25 will be placed in the After School Program at the drop-in rate. Students participating in after school activities of any kind (clubs, tutoring, d-hall, etc.) are to be picked up promptly at dismissal of that activity. Students not picked up by a parent or guardian within 15 minutes of the dismissal of their activity will be sent to After School Program at the drop-in rate. Parents who consistently fail to pick up their children will be scheduled for a conference with the principal. Pre-school and Kindergarten children are to be picked up by 3:25. When leaving the school during the school day for any reason, the student is to check out through the office. A parent or responsible party is to sign the student out through the office. The date, time, and reason for leaving should be recorded. When returning to school during the school day, the parent or responsible party is to check the student in through the school office. The student will obtain an admittance slip from the office to be admitted to class. A “responsible party” is defined by the school as someone who is listed on the child’s emergency card and has permission to pick up the student. No child will be released to a person not listed on the emergency card without signed notification from the parent. In case inclement weather necessitates the closing of school, IC School will abide by the decision made for the Catholic schools in the city as announced by the media and through the IC School notification system. DO NOT CALL THE SCHOOL OR THE CHURCH OFFICE. Following Diocesan policy, IC will implement a Cyber Day policy for schoolwork requirements on “snow days”. Cyber Days involve at-home assignments (some of which will require internet capability) to keep students on schedule with curriculum. Estimated completion times for Cyber Day assignments will be age appropriate. More details will be disseminated as needed. If the schools remain open and the weather is threatening, each family will have to decide whether to send their children to school. If the school is in session and the weather conditions deteriorate, listen for news of early dismissal. Also, check RenWeb for any closure communications. Make sure you have made arrangements to get your child home safely. If you cannot listen to the news, you are responsible to have someone other than the school listen for you and get in touch with you. Our telephone lines have to be left open for emergency calls. The school will not have staff to protect your child after the closing time. * PLEASE NOTE: If school closes due to inclement weather, IC After School Care is also cancelled. Immaculate Conception Catholic School has a comprehensive crisis plan as required by law in the event of any catastrophic or cataclysmic emergency. Parents may view our Comprehensive Crisis Procedures Manual at any time at the school office. If a child is absent, call the school office directly before 9:00 a.m. (Please DO NOT simply email the teacher, as the office must also be aware of the absence). Students in grades K-6 may request to pick up work in the office beginning on the first day of absence, provided that the request is made before 9:00 a.m. Requested work will be available at the end of the school day. Students in grades 7-8 may request to pick up work in the office beginning on the second day of absence, provided that the request is made before 9:00 a.m. Requested work will be available at the end of the school day. When the child returns to school, he/she should bring a note to the teacher stating the reason for the absence. Apart from an emergency situation or other extremely extenuating circumstance, no teacher will give work ahead of time. In the case of a substitute teacher, make-up work will not be sent to the office. Generally a student who has accumulated twenty-five (25) days of absence during the school year should repeat that grade. When requesting that a student be excused from school for any planned reason, parents are to submit a WRITTEN REQUEST IN ADVANCE to the principal and teacher. 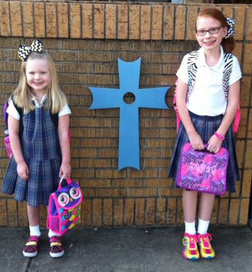 Immaculate Conception Catholic School has vacation time worked into its annual schedule. School families are expected to respect classroom instruction days and make use of the scheduled breaks for vacation. Absences for vacations are considered unexcused absences. Except for an emergency or some other extremely extenuating circumstance, teachers will not write out assignments/lesson plans in advance and are not required to make up tests and assignments when the child returns from the absence. We ask for the cooperation of our school parents to respect our instructional schedule, as we pledge ourselves to respect the scheduled vacation times. NO student may leave the school premises during school or absent themselves from school-sponsored functions and events without the express permission of the principal. A student who violates this rule will be subject to disciplinary action at the principal’s discretion. Truancy or suspected truancy will be referred to the principal. Parents of the student will be contacted and the consequence of such action will be at the discretion of the principal. Promptness is a trait to be developed. Parents, through their efforts, help develop this trait in children. A student is considered tardy if not in the classroom when the second bell rings at 7:50 a.m. The student should report to the office to obtain a tardy slip. Tardiness interferes with a child’s progress in school and constitutes a disturbance for all members of the class. Parents are urged to make every effort to have their children at school on time. A student reporting late or tardy to school due to a dentist or doctor appointment must have a note from the doctor or dentist to prevent being marked unexcused tardy for that day. A parent or responsible party are to accompany tardy students to the office to sign him/her in. The curriculum will follow diocesan requirements regarding basic materials, specific courses and time allotments. A planned instructional program will lead to discovering and developing the abilities of each student. IC offers a balanced curriculum including Religion, Language Arts, Spelling, Reading, English, Science, Mathematics, Social Studies, Art, Music, Physical Education, Spanish, Computer Technology and such electives as deemed practical and helpful. Providing an atmosphere conducive to study. Showing an interest in their child's work. Realizing that homework does not solely consist of written work, but that both written and study work are important. Expecting the child to have assignments for homework written down. The use of an assignment book is required for grades 2-8. Checking with the teacher if the student repeatedly says he/she has no homework. A teacher may offer incentive bonus points to the entire class. Extra credit work will not be offered to individual students in order to bring up a grade. In order to ensure the proper progress of our students, it is imperative that all class work and homework be turned in by the deadline assigned. Therefore, apart from an emergency or any other extremely extenuating situation, the following consequences will result from work being turned in late. No late work will be accepted in grades 5-8. Failure to turn in work at the assigned time will result in a “ZERO.” Penalties for late work in grades K-4 will be at the discretion of the teacher. If a student is absent on the day an assignment is due, the assignment is due on the first day the student returns to class. In the case of a student having a diagnosed learning difference, the parent may request a conference with the principal and teacher to develop a modification plan. A copy of test results and suggestions for modification must be filed in the school office. It is the responsibility of the student to get all assigned work missed due to absence. In the case of a substitute, students are to check with the teacher upon the teacher’s return. Verification of missed assignments should be made with the teacher. One day will be given for each day absent to complete assignments/tests. Make-up work not completed on time will be given a zero. In case of a one-day absence on the day of a test, the student will be expected to take the test the day the student returns to school. In case of lengthy illness, the student will see the teacher to set a schedule for turning in missed work and tests. Tests missed due to absences may be made up after school during detention hall for grades 5-8. Report cards are sent home at the end of each quarter or nine (9) weeks period. All report cards require the signature of the parent and are to be returned to the school within one week of dissemination. If your child’s academic progress is low in a subject, use the report card as an opportunity to PLAN for improvement. Create success for your child by praising good work. Any dispute concerning a grade must be made in writing within one week of the receipt of the grade. Grades 1-8 assignment scores for will be updated on RenWeb weekly. Interim grades will be evaluated approximately 5 weeks into the quarter. Students with a D or F will receive a printed mid-term grade report, which is to be signed by the parent and returned the following day. Parent/teacher conferences are scheduled during the end of the first and third quarters. The Honor Roll is reserved for students in grades 3-8. Students in grades 3-8 earn “A” Honor Roll status by receiving no grade lower than an “A” in any subject including enrichment courses. A student will earn the “A/B” Honor Roll when no grade earned is below a “B” in any subject including enrichment courses.. Promotion to the next grade level is based on the passing mark of 60% in all major subjects. Course failures are to be made up over the summer and documentation of acceptable academic progress must be available to the school principal prior to recommendation for promotion. If the possibility of grade retention is evident based upon teacher evaluations, the parents will be notified by the end of the third academic quarter. See Discipline/Conduct (on page 19-19) for items that affect the conduct grade. Academic eligibility is determined at the beginning of each nine-week grading period. Students are required to maintain an overall average of 70% in all subjects including enrichment courses. However, no grade in any one subject can be below 60%. A student will become ineligible if conduct grade drops below 80%. Students declared ineligible may regain eligibility at mid-term or at the close of a nine-week period by meeting the established academic criteria listed above. A student will not become ineligible at midterm due to academic deficiency; however, any student whose conduct grade drops below 80% will be declared ineligible at the time the grade drops below 80%. Students participating in any school-sponsored extracurricular activity must maintain a grade of “B” in conduct. Students in grades 5-8 will have conduct grades determined by a point system; each student will be assigned 100 conduct points at the onset of each quarter. For infractions identified pursuant to the IC conduct sheets, points will be deducted from the initial 100; when a student drops below 80 points, extracurricular eligibility will be forfeited. Reinstatement of extracurricular eligibility will be adjudicated at the next midterm. In case of any and all behavior problems or misconduct, the principal reserves the right to withdraw any student from any extracurricular activity. Immaculate Conception Catholic School (IC) is dedicated to providing 21st century instruction to all students. In a 21st century learning environment, students actively engage in the integrated curriculum and have access to information and apply it to solve problems. Access to the Internet enables students to explore thousands of libraries, databases, and documents throughout the world. Families should be warned that material accessible via the Internet might contain items that are illegal, defamatory, inaccurate, or potentially offensive to some people. The intent is to make Internet access available to further educational goals and objectives. We believe the benefit of students accessing the Internet, in the form of information resources and opportunities for collaboration, will exceed any disadvantages. But ultimately parents and guardians of minors are responsible for setting and conveying the standards their children should follow when using media information sources. The school supports and respects each family’s right to decide whether or not to apply for access. Students are responsible for behavior on school computer networks just as they are in a classroom or school hallways. Students must comply with all IC policies concerning student conduct and communication when using IC computers and other devices whether on or off school property. The network is provided for students to conduct research and communication with others. Access to network services is given to a student who agrees to act in a considerate and responsible manner. Parent permission is required. Access is a privilege--not a right. Access entails responsibility. Individual users of the school computer networks are responsible for their behavior and communication over the networks. It is presumed that users will comply with school standards and will honor the agreement they have signed. Beyond the clarification of such standards, the school is not responsible for restricting, monitoring, or controlling the communications of individuals utilizing the network. Network administrators may review files and communications to maintain system integrity and ensure users are using the system responsibly. Users should not expect that files stored on school servers or school cloud services would always be private. There should be no expectations of privacy when using the school computers, computer network, or computer system. The administration or teacher has the right to access information stored in any student file on any student screen, or student email. Transmission of any material in violation of U.S. or state law is prohibited. This includes, but is not limited to: copyrighted material, threatening or obscene material or material protected by trade secret. Hardware or software shall not be damaged, modified, or abused. Intentionally altering the files, data, or software on the school computers will be viewed as vandalism. Students will access computers using their own credentials. Students will not share anyone else’s name, password, or personal information. Students will not use any program other than those directed by the teacher nor for any purpose other than those directed by the teacher. Students must notify the teacher immediately for inappropriate material found. Use of the Internet without knowledge and permission of a teacher or administrator is prohibited. Students may not download programs without permission. Students will use polite language. Obscene language, harassing, insulting, or attacking language will not be tolerated. The principal, teacher, and the student’s parents will be notified of the specific violation. The student completes the assignment using a home or public library computer. A written record of the infraction and sanction applied will be kept on file. IC implements a Bring Your Own Device (BYOD) policy. This allows students to bring their own personal computing devices to school to enhance the instructional learning process. The acceptable use policy applies to all devices brought onto campus. BYOD: An acronym for Bring Your Own Device. For BYOD a “device” is a privately owned laptop, tablet computing device, e-reader, netbook, notebook, iPod Touch (or similar), or cell/smart phone. For the purposes of this program, the term “device” also includes any similar product owned by IC Catholic School and provided for student use. Access: Wireless connection to the Internet using the IC wireless network may be monitored and/or recorded for security and student safety. Students must adhere to all guidelines previously stated. The student is fully responsible, at all times, for the personally owned device brought to IC School. IC is not liable for any loss/damage/theft of a personally owned device. The student is responsible for the condition of the device brought to school, including updates, antivirus software, repair, and service. IC will not provide software to any device that we do not own. All technology must be preloaded with the appropriate material. IC is not responsible for the content of the materials on the device. The parent of the student is expected to ensure that all material on the device is age appropriate for the student. Personal devices should be charged and recharged outside of school, unless specific permission is granted. Personal devices should be capable of lasting a full day without recharging. Purchasing perishable supplies (e.g. ear buds) to be used with equipment not owned by the school is the owner’s responsibility. Students may not use any device or service for non-educational purposes during school hours, unless granted permission by the teacher, staff, or an administrator. No device, personal or otherwise, may be used to record, store, or transmit any type of image, sound, or video of staff or students without permission. Distribution of such media may result in suspension, criminal charges, or expulsion. Devices are to be “OFF” when they are not being used for academic purposes. Students can only access the network using the provided wireless network, not private networks. Students are not allowed to use their own 3G or 4G (celluar) services while at school. If it is a cellular enabled device, it must be placed on airplane mode. Students who use private networks (3G, 4G, hotspots, etc.) at school to access inappropriate information will be subject to disciplinary and legal action. Students should use headphones (may bring their own from home) when listening to audio files on their device while working. The volume should be kept at a level that doesn’t disrupt others. Students may listen to audio files with permission from the teacher. Parents/students are responsible for keeping track of the device’s serial number, model and type. IC highly encourages users to keep this information in a safe place should theft, vandalism, or accidents occur. Offense – Any offense will result in device being confiscated by staff and turned in to the office. The principal or assistant principal will notify the parents. The parents must pick up the device, sign for it, and assume responsibility for proper use by the student. The student faces penalties for insubordination and termination of BYOD privileges for a full 9 week period. * The school administration reserves the right to terminate a student’s BYOD privilege at any given time. *If a student violates the Acceptable Use Policy with less than 9 weeks remaining in the school year, the remainder of the student’s termination of BYOD privileges will carry over to the following year. IC is an official Google Apps for Education School offering users a free educational suite of applications for use to enhance learning. Google Apps is a concept known as “cloud computing” where services and storage are provided over the Internet. IC has the capability to limit messages/use based on various parameters. In order for users to gain access to Gmail and his/her Educational Google Apps account, IC must obtain parental permission. By completing the IC School Parent/Student Statement of Responsibility you grant permission for your child’s access to Google Apps Education tools. All rules in Section 1 of this AUP apply to student use within Google Apps. Personal Responsibility: I will accept personal responsibility for reporting any misuse of the Google Apps to the teacher/administration. Will not use Google Apps to post any web pages for commercial activities, product advertisement, or political advocacy.Will not use Google Apps to post any obscene, discriminatory or offensive material. All material posted will be in keeping with school assignments. I understand that school administration has the right to monitor all postings including emails. I understand that email sent through my account may be scanned for content violating the terms of this agreement. I understand that email sent via the Google Apps must be school related and abide by guidelines in the AUP. Privileges: I understand that the use of the Google Apps is a privilege, not a right, and that inappropriate use will result in a cancellation of those privileges. The system administrator(s) may close an account at any time deemed necessary. Network Etiquette and Privacy: I understand and will abide by the generally accepted rules of network etiquette. Parent/Student signature on Parent-Student Statement of Responsibility applies for this Student Technology Acceptable Use Policy. The ultimate goal of Immaculate Conception’s discipline system is to teach students to demonstrate responsibility for their own behavior, as well as to teach that there are consequences for improper actions. If corrective measures are needed, the teacher shall use constructive and positive measures. In cases of major offenses, the student will be sent to the office. A consultation with the parents may be called if a major problem arises. Any student in grades 5-8 who is sent to the office for disciplinary measures will lose 4 conduct points on his/her conduct grade for the class from which the student is sent at the discretion of the school principal. Points lost while under supervision of a substitute teacher will double in value. School discipline is essential in maintaining an effective educational atmosphere. The methods used to teach and discipline a classroom of students are often different from those utilized to train one child within a family, yet these methods must reflect basic standards of fairness and formative Christian charity. It is a privilege to attend Immaculate Conception Catholic School. This privilege can be lost by actions of the child or the parent. It is extremely important that a child be thoroughly convinced that his/her parents stand behind the school and that they will demand an accounting of what the child does in school. Without such a clear understanding, a child can come to think that home and school are separate and unrelated areas of authority, and he/she can soon learn to play one against the other. Likewise, we consider it a privilege to educate your child. We take our job seriously and know that in the amount of time we interact with your child we have the responsibility to instill important Christian principles through our words and actions. We can best serve our children by working together, by checking out whatever misunderstanding might arise, and by supporting one another in all aspects of education and discipline. If there exists a difference of opinion, we ask that you call to make an appointment in order that we may discuss the matter. It is feasible that it will not be possible to conform completely to your wishes, but there can certainly be some understanding established which would safeguard the child’s respect for both parent and teacher. Serious or continuous disciplinary problems will be referred to the principal. Parents will be notified of the infractions and of the disciplinary action taken. If the student cannot be helped by the disciplinary action, the principal may follow the procedure for suspension or expulsion as outlined in policy 2.13 Suspension and 2.14 Expulsion of the Diocesan handbook. The administration reserves the right to waive and/or deviate from any and all disciplinary regulations for just cause at his or her discretion. Statement of Confidentiality: Teachers will keep confidential information entrusted to them as long as no one’s life, health, or safety is at stake. Students will be mannerly, courteous, and respectful. The learning environment will be orderly, quiet, and conducive to study. Students will respect school property and the property of others. Students will WALK and remain quiet when moving through the building. There are individual classroom rules that each teacher will post in the classroom. Every student will be expected to know these rules. Infractions of these rules will result in warnings (oral), reduction in conduct grade or detention. Each student will have a single conduct record that is used by all teachers to record infractions. Each student will start the 9-week period with 100 points in conduct. One point will be deducted for each infraction. Infractions include: talking, eating food or candy in class, lacking materials for class, being tardy to class after initial arrival at school, being disrespectful, disruptive, or uncooperative, etc. Behavior deemed unacceptable by the teacher will be referred to the school administrators. Any student sent to the office will have 4 points deducted from their conduct. Grades 5-8—an accumulation of five (5) uniform infractions will result in one hour of detention hall. Every infraction thereafter will result in the loss of a conduct point. Ten (10) uniform infractions will result in a parent conference with the principal. ***Consistent disregard of dress code policy will be considered a serious disciplinary offense (see Discipline/Misconduct//Serious Offenses section of the handbook). Grades 1-6: at the loss of 10 points in a student’s conduct grade, students will serve 1 detention. Each additional 10 points equal another detention. Grades 7-8: at the loss of 5 points in a student’s conduct grade, students will serve 1 detention. Each additional 5 points equal another detention. Grades 5 - 8 attend detention for 1 hour. 1st, 2nd = One detention hall session. 3rd = Saturday morning detention (7:00 – 8:30) as scheduled. Conference with parent, teacher, and school administrator; possible suspension from school may result. 4th or more detentions Conference with parent, student, school administrators, and pastor to decide course of action; expulsion possible. Any student assigned D-Hall for behavior purposes will lose 2 conduct points.. Detention hall is held on Tuesday and Thursday from 3:15 to 4:15 p.m. for grades 5 - 8, and 3:15 to 3:45 for grades 1 - 4. Failure to attend the assigned detention hall. Failure to return a parent-signed detention hall slip the day after issue. Talking or disruptive behavior during detention hall. Any student who comes late to detention hall will make up that amount of time after 4:15. If a student is more than 10 minutes late, an additional hour of detention will be assigned. Chewing gum is prohibited at Immaculate Conception School. Any student discovered chewing gum will serve one hour of detention hall. When students post to social networks, they must be ever vigilant to follow Christian morals and principles at all times. Vulgar or unchristian-like postings or photos will not be tolerated at any time. Remind students that we are all representatives of IC School whether we are at school, attending a school function, at home, or at friends’ houses, out in the community, or at any other time. Students should not, at any time, send negative text messages, set up fake pages, talk badly about teachers, administration, staff, or other students. Any of the above infractions will be considered serious and may be grounds for in- or out-of-school suspension, d-hall, loss of conduct points, possible expulsion or any other consequences deemed appropriate by the school administration/pastor. Disruptive or inappropriate behavior by a student at school-sponsored activities that occur outside of normal school hours (athletic events, programs, etc.) will be subject to the same disciplinary actions as if the offense took place during normal school hours. Principal/Pastor reserves the right to determine the most appropriate consequences for misconduct. All persons are to extend the courtesy of respectfulness to one another and each person shall have the freedom of safety in our school environment. “Bullying” is behavior resulting from one exercising power over another, constituting an unfair advantage that tends to be a repeated pattern of action. This type behavior may be in the form of physical strength, social skill, verbal talent, or other resources. Verbal abuses could be in the form of name-calling, teasing, or threats. Other bullying behaviors may take the form of physical abuse such as striking another person, pushing, or shoving. Social bullying may be the result of excluding one from a group or playing mean or cruel tricks on another person. The intent of the policy is to deal with these behaviors early on and avoid serious consequences. Each student, parent, teacher, or staff member shall report any suspected instances to the proper school authority. A student who is either a recipient of or aware of such behavior will be considered to be in violation of school disciplinary policy if he/she fails to report such behavior. This expectation will remove the fear of being a “tattle-tale” and will free him/her to present to a school authority the information needed to eliminate the abusive and bullying actions. Similarly, should any student suffer any type of retribution for presenting such information, the student(s) responsible for such retribution will suffer a much more severe penalty than would otherwise be the case. Penalties for bullying behavior will be at the discretion of the principal. Please report suspected bullying to the principal or assistant principal. Isolation from all other students during lunch and every recess. For those involved in athletics: no participation in practice or game, no starting during game in which he/she returns (similar penalties for those in other extracurricular activities. Possible in-school suspension/d-hall at principal’s and/or pastor’s discretion. WRITTEN PENALTY (to be completed during the penalty week) Reports on the following topics to be submitted to principal with a copy to the Pastor. Day 3: Three thorough one-page apologies: one each to victim, principal, Pastor. The student may be required to read any or all of these written penalties to the Pastor. The Principal and the Assistant Principal will determine the proper penalty based upon the rules of the school as found in the School Handbook. The penalty will be communicated in writing to the students involved and to their parents. All discussion of the alleged incident will take place in private and away from all other students. When the alleged incident directly involves either the Principal and/or the Assistant Principal, the Principal and/or the Assistant Principal will not be involved in the investigation of the incident or in the setting of the penalty. The Pastor will appoint someone else to function in his or her stead in the matter. Any conduct detrimental to the reputation of the school whether on school premises or off shall constitute sufficient cause for disciplinary action including, but not limited to, loss of conduct points, detention, suspension and/or expulsion. Serious offenses may result in any of the following: loss of conduct points, disciplinary action, detention hall, suspension (in or out of house), or expulsion (at the discretion of the principal). All serious offenses result in the loss of 2 or more conduct points. * Applicable above violations will be reported to the proper authorities. Suspension is defined as the temporary expulsion of a student from a school for disciplinary reasons. Suspension is the decision of the principal and/or pastor. The principal will notify the parent or guardian of the reason for the suspension, the time of suspension, and the requirements for reinstatement. A suspension may not exceed ten (10) days. All work missed due to a suspension must be made up, and the student will receive 80% credit of the grade. In-house suspension is a disciplinary action taken due to serious or major offenses; students receiving such punitive disciplinary measures will be removed from the classroom and placed in a quiet area of the school building. Students may be required to sit quietly or complete classroom work; any classroom work provided while serving an in-house detention will receive a 20% reduction in grade earned. Expulsion is defined as the permanent dismissal of a student from school. After a conference with the student and parent, expulsion will be the decision of the principal and the pastor. A written report containing the reason for the expulsion will be sent to the student’s parent or guardian and to the Diocesan Superintendent's office. The purpose of the dress code: reminding all of the Christian dignity and equality of each person before God, regardless of family financial situation; and to illustrate to students the serious and high purpose of Catholic education—forming the mind and character of each individual. Student compliance with the dress code is ultimately the responsibility of both the student and the parents and is enforced by the faculty or administration. Consistent compliance with the dress code helps one grow in understanding of obligation and the virtues of discipline and obedience; virtues that, when cultivated, naturally enhance respect for religious, parental and civil authority. Uniform attire may be purchased at any store provided uniform regulation guidelines are followed. Shirts - tucked in at waist at all times (on campus and at school activities) so belt or waistband is visible. Solid white t-shirts with no logos or writing may be worn under uniform shirts. Grades K – 8 IC Logo uniform shirt (“Mass shirt”): white polo with embroidered IC logo, available through the Toggery. “Mass shirt” will be worn at all Masses, school field trips, and other designated days. Grades PK-6 Navy blue twill uniform (worn at waistline). Grades 7-8 Khaki twill uniform (worn at waistline). Shorts - no shorter than three (3) inches from the floor while kneeling and no longer than 2 inches below the knee. No shorts may bag or sag. Grades PK-6 Navy blue twill uniform (worn at the waistline). Grades 7-8 Khaki twill uniform (worn at the waistline). Skorts/Skirts/Jumpers - no shorter than 3 inches from floor while kneeling. Shorts are to be worn under skirts/jumpers and should be shorter than the skirt/jumper. Grades PK-8 Athletic shoes. Shoes must fully enclose the foot and are to be laced and tied/fastend at all times. Velcro is recommended for students unable to tie their shoes. No extreme styles, i.e. lights, wheels, athletic toe-shoes, etc. Grades PK-3 Mary Jane (uniform) shoes are allowed. Grades PK-8 Tights and Leggings - Navy blue, plain (no designs), full length. Leggings to be worn under skirts/skorts and MUST be tucked into socks with no ankle showing. Belts - Grades 2-8 Black, brown, navy blue, khaki or IC plaid belts are required if shorts or slacks have belt loops. Belts are optional for Pre-K through 1st grade. Headbands, barrettes and ponytail holders in IC plaid or any solid color found in the IC plaid. Brown and yellow are also acceptable. No outrageous designs or oversized hair accessories (e.g., feathers, weaves, large flowers, tinsel, etc.) may be worn with the IC uniform. No bandanas. Nail Polish/Makeup - None allowed, except Grades 7-8 girls may wear clear polish or "French Manicure"
1 watch and 1 ring permissible. A religious necklace on metal chain may be worn. (Student may be asked to take necklace off PE/recess for safety) Scapular may be worn under shirt. Hair shall be worn in an appropriate manner, never extreme. Hair color may not be extreme. Girls - hairstyles must be off the face and out of the eyes. Hair feathers, ribbon braided in hair, etc. is not permitted. Boys - length shall be trimmed above the shirt collar, ears, and eyebrows. Extreme hairstyles (i. e., highlighted, streaked, dyed or bleached hair, mullet, Mohawk, etc.) are prohibited. Boys’ hair should be kept within guidelines at all times to avoid penalties. Final decision for appropriate hairstyle rests with principal. No body graffiti (no drawing on arms, legs, etc.) is allowed at any time while at school. Grades 5-8 Girls and boys are required to wear the IC physical education attire during PE class. These items must be purchased through The Toggery. Grades PK-4 are not required to wear PE clothing. Parochial League athletics uniforms - (cheerleading and football) are permitted as approved by the principal—generally only on the Friday prior to a scheduled game (football players may wear the jersey only). Cheerleading uniforms may be worn at Mass only with the cheerleader sweatshirt. Scouts are allowed to wear their respective uniform on the school day of their scout meetings. OUTER WEAR - All coats, hats, mittens, rain gear, etc. will be stored in the classroom while class is in session. These items may be worn to lunch and recess only. **Parents please note that it is advisable to label your child’s personal effects for the purpose of identification. Tag Days are days students may wear clothing other than school uniform. Clothing must be modest and in good taste. Parents should check designs and logos on shirts before leaving for school. There are many advertising logos that would not be appropriate. Special Tag Days: Some tag days will have additional guidelines (holiday, Falcon spirit, etc.) that will be communicated at that time. Parents, please contact the school office with questions regarding any dress code prior to your child’s arrival at school. Students arriving at school inappropriately dressed will receive a uniform infraction AND be sent to the Principal’s office, and parents will be called to bring school uniform. Grades K-2--Follow grade level procedures/ consequences. Grades 3-4--an accumulation of five (5) uniform infractions will result in one half-hour of detention hall. Grades 5-8--an accumulation of five (5) uniform infractions will result in one hour of detention hall. Every infraction thereafter will result in the loss of a conduct point. ***Consistent/willful disregard of dress code policy will be considered a serious disciplinary offense (see “Discipline” section of the handbook). Parents are to discuss problems with the respective teacher. Discussions at school however, should be scheduled before or after school hours, or at an agreed upon time. If the problem is still not resolved, parents may then confer with both the principal and the teacher. Social network sites are not the appropriate arena for these types of discussions. If no solution is found, the matter will be referred to the superintendent. Excluding devices specifically used following BYOD policy for educational use, electronic devices (which include, but are not limited to CD Players, electronic games, cell phones, iPads, iPods, smart phones, cameras) are not allowed during school hours (7 am – 3:15 pm) without written consent from the teacher or administrator. Cell phones, smart phones, iPods, iPads, cameras or any other electronic devices may not be on or visible inside any school facility between the hours of 7 A.M. and 3:15 P.M, including dismissal time. Electronic devices taken from students will be held in the office until a parent /guardian retrieves it. Any student’s electronic device in operation during school hours will be considered a violation and will warrant detention. Electronic devices are the sole responsibility of the student and IC does not accept responsibility for loss or damage. Knives or other weapons of any kind are forbidden. Any student found with a weapon of any kind will be sent immediately to the office, the parents notified, and the student sent home. Further disciplinary action will be at the discretion of the principal and/or the pastor. The civil authorities will be notified when required by law. Normally, money would not be needed at school; however, in cases where money is sent the following protocol should be followed: money sent to school to pay for items or school services should be enclosed in an envelope with the student's name, grade, homeroom teacher, amount, and purpose for the money written on the envelope. If a book is lost or destroyed, the student will be responsible for the replacement cost. The privilege of checking additional books out of the library or classroom will be rescinded until restitution is made for the lost or damaged material. At the close of the year, report cards will be withheld until payment of the book replacement cost is made to the school. Play in the area assigned. Show consideration for others using the same playing areas. Show respect for the teachers or any adults on supervision. Fighting, pushing, tearing of clothes, inappropriate language, or other disorderly conduct is not acceptable. Students shall go outside during recess and lunch period when the weather is permissible. When air temperatures are considered too “cold” or too “hot” students may be kept inside (at the discretion of the principal, teacher, or playground supervisor). If for health reasons, a child cannot go outside, a written note from the parents to this effect is required. Students are not to reenter the building during recess periods without the permission of the playground supervisor. It is a school policy that all students will eat in the school cafeteria. They may eat a purchased lunch from our kitchen or a sack lunch from home. The cafeteria staff will not heat lunches brought from home. Students are not allowed to leave campus for lunch for any reason. They are not allowed to have lunch from a fast food chain or restaurant brought to them. All teachers are responsible for supervising student conduct in the cafeteria. Teachers will accompany students to the cafeteria and monitor their behavior. Students are expected to conduct themselves properly during lunch, practice good table manners, and follow the rules listed below. All students will eat either a lunch prepared by the cafeteria staff or bring a lunch from home. After receiving lunch trays, students will be seated and remain seated at the table until dismissed by the teacher. Students are not to throw food or take food out of the cafeteria. Students will be courteous to the cafeteria staff, using "Please" and "Thank you". Parents/Visitors desiring to eat lunch with their student in the school cafeteria are asked to call the office by 12:00 noon on Thursday the week prior to dining in order to make a reservation. Parents/Visitors may dine with their student Monday - Thursday. Unfortunately, space is limited. Students are not allowed to have lunch from a fast food chain or restaurant brought to them. Parents/Visitors are encouraged to purchase a lunch from our kitchen. Parents will sign in the school office and get a visitor badge before going to the cafeteria. Students who continually disregard the cafeteria rules will be referred to the office for disciplinary action. Soft drinks are not to be brought as part of a school lunch. Regular milk, chocolate milk and water will be offered at lunch. If a student has an allergy or intolerance to milk, juice will be offered. The parents will need to send a doctor's note to the office stating the student's allergy treatment. The note will be filed in both the school office and cafeteria. If a student has an allergy to peanuts or other foods, the parents will send a doctor's note to the office stating the student's allergy treatment plan. The plan will be filed in the school office, cafeteria, with teachers and playground supervisors. An EPI pen must be provided for each student with a peanut allergy. The medication must be in the original container with the child's name on the prescription. A consent form must be signed before any medication will be given at school. The child's name, type of medication, amount to be given, and parents' signature must be included on the form. Permission for long-term medications must be renewed at the beginning of each school year. Minor accidents are taken care of by a member of the school staff or school nurse. In case of a serious accident, the principal, nurse, or other school authority will contact the parents as soon as possible. If the parents cannot be reached, the emergency number on file will be tried. If the emergency number cannot be reached, the injured child will be taken to the hospital immediately. If a child becomes sick at school, the parents will be contacted. The parents or another adult designated by the parents must come to take the child home. No child will be allowed to go home alone. A child running a fever must be picked up and will not be allowed to remain at school. Parent(s) and/or guardian(s) must report any communicable diseases to the principal. The identity of the infect student, as well as all health and other pertinent records shall be kept confidential and the number of people who are aware of the student's condition will be kept at a minimum. Before returning to school, the student must be past the period of communicability, that is fever, vomit, and./or diarrhea free for 24 hours and able to participate in normal classroom activities. Conferences between parents and teachers are encouraged for good communication between home and school. E-mail communication is available with teachers and highly encouraged. Teachers will return emails as their schedules allow, most commonly at the end of the school day. Call or write in advance to schedule a meeting with your child's teacher. Most appointments with the teachers are scheduled before or after school hours. Parents are not allowed to “drop in” to see a teacher before or after school without a scheduled appointment. Upon arrival, parents must check in at the school office; the teacher will then be notified and called to the office. Appointments with the principal may be made during or after school hours. ALL parents, visitors, relatives, and former students are to report the school office to check in before, during and/or after the school day. If (for a very special occasion), you wish to eat in the cafeteria, you must call the school office (835-0771) before 8:30 a.m. School lunch is available for order. School age visitors to IC School may visit only during lunch and recess times and are to be supervised by the adult who brought him/ her to school. Persons disturbing private schools by their conduct or trespassing on school grounds during recess or while school is in session are guilty of a misdemeanor. Student use of the office telephone shall be limited to EMERGENCY CALLS. Neither teachers nor students are called to the telephone during class hours unless it is an emergency. Your child should know arrangements for after-school transportation BEFORE he/she comes to school. Please DO NOT CALL THE OFFICE concerning transportation and homework assignments unless it is an emergency. In order to encourage responsibility, students will not be allowed to call home for forgotten homework, books, PE clothes, or other items. If parents realize such items have been forgotten and bring them to the school office (students will not be called out of class to pick them up) school personnel will facilitate the delivery of such items to the student. No gifts for students are to be delivered to the school office or the classroom. Only movies with a MPAA rating of “G” (General Audiences) will be allowed to be viewed at the school. Middle school students (or Grades 5-8) may also be allowed to view movies rated “PG” (Parental Guidance Suggested) if the teacher has previewed the movie prior to showing it to his/her class, and has received prior approval from the Principal. (The Principal will consult the USCCB listing of movie reviews for information.) “PG – 13” movies are not permitted. K-8 After School Care may screen some teacher-previewed PG movies. Parents must request in writing if student is not to view any PG movie. Field trips are a school-sponsored function/activity and part of the IC Curriculum. The principal will approve all field trips. If a teacher plans a field trip for the class, a notice will be sent home to the parents. The parent(s) must sign this note giving permission for the student to participate. A student will not be permitted to attend a field trip without a signed permission slip. A faxed copy is acceptable; a phone call is not. The teacher reserves the right to deny a student field trip permission. Students falling below a “C” average in conduct will not be allowed to attend field trips during that quarter. Parents who drive must also send in their child's permission slip. Each child must wear a seat belt while being transported. Due to air-bag safety for the student, no student will be permitted to ride in the front seat of a car. Siblings are not allowed to accompany parents on a field trip. WHEN GOING TO OR FROM THE FIELD TRIP DESTINATION, PARENTS ARE NOT TO GO TO ANY OTHER LOCATION OR INCLUDE ANY SIDE TRIPS UNLESS PERMISSION HAS BEEN OBTAINED BY THE TEACHER. Proof of CMGConnect: Safe Environment online training (or record of VIRTUS). The number of drivers/chaperones is often limited. To be considered a field trip volunteer, ALL paperwork and procedures must be completed ONE WEEK/7 Days in advance of the scheduled field trip, or by the teacher’s posted and scheduled timeline. Fire drills will be conducted once a month. Students will be informed of the fire exit plans. Tornado drills are conducted several times during the school year. According to the Diocesan Handbook, school sponsored extracurricular activities may be held with the approval of the pastor and/or principal. All school-sponsored activities will be appropriately supervised by faculty members or parents. DANCES - Dances are not permitted as school-sponsored functions for elementary schools (K-8). Parents should be encouraged to sponsor other entertainments and activities for elementary students. As an IC school parent, you will be a member of the IC PTO. Each family's dues are paid at the time of registration. The PTO will be conduct periodic meetings. Notices will be sent home to inform parents of the date, time, and special topic of the meeting. You are expected to attend the PTO meetings, support projects adopted by the membership, and if necessary, serve in various leadership capacities in the organization. The IC Administration and/or IC School Board must approve all school fund-raisers before they can be implemented. The members of the Board of Education are appointed by the pastor, elected by the school parents, or a combination of these two. The function of a school board is to establish policy, not to administer the school. Administrative decisions are the responsibility of the principal, in cooperation with the pastor, who seeks to conduct the educational programs in terms of established policy. The school board meets on a regular basis. Vision, hearing, and scoliosis tests are provided periodically (for certain students) by qualified personnel. If the results indicate that additional tests are needed, the parents of the child are notified. Immaculate Conception School is constantly in need of volunteers to aid and assist faculty and staff in providing an outstanding education. A list of volunteer opportunities is available at registration. Parents, grandparents, aunts, uncles, and friends are all encouraged to volunteer— each family is expected to provide a minimum of 20 hours of volunteer work annually. (Please see Fair Share Hours Program description in this handbook for further explanation.) A form must be signed stating the volunteer has read the Sexual Abuse or Sexual Exploitation of Children policy when working with or around children. The volunteer must also have completed CMGConnect:Safe Environment online training or record of VIRTUS attendance. Participation in school-sponsored activities is an excellent way for students to develop talents, serve their community, acquire new skills and build strong friendships with other students. IC is fortunate to be able to offer many clubs and organizations for students to grow and develop outside of the classroom. Clubs availability depends on availability of club leaders. Students are to maintain exemplary behavior while participating in these activities, respecting the leaders, fellow students and school environment. Participation in these activities requires a B or better in conduct and passing grades in all academic subjects. Refer to the Grading Section/ Extracurricular Activities for a full explanation of eligibility requirements. Along with Student Government, the following clubs/organizations are currently available at IC. Crafter Club (grades 5-8) is open to students who want a little more time exploring all the art room has to offer. In past years club members have worked on projects to sell at the The Shoppes at IC, an annual bazaar put on by the IC Arts and Crafts Society. Crafter Club typically meets every other week. Little Rockers (grades K-6) meet after school once a week starting during the month of September. They run a set course with the intention of racking up 25.2 miles before the Little Rock Marathon in February. On race day, the Little Rockers run the last mile of the marathon to complete their full 26.2-mile marathon. Battle of the Books (grades 4-6) Members read a selection of books and compete as teams in battles over what they have read. One team from IC competes in the statewide tournament in the spring. BOB meets once a month until February, when they switch into battle mode and meet once a week. Spelling and geography bees pit a student from each classroom grades 4-8 against one another in a bid for spelling or geography mastery. The school winner then goes on to compete in the county bee. Chess Club (grades 4-8) meets once a week. Handbells (2nd grade). Handbells meet once a week and practice songs to play at both school and weekend Masses. Chiors Seraphim Choir (grades 3-5) and Junior High Choir (grades 6-8) meet once a week and perform at school Masses. Some members are selected to cantor as well. Beta Club (grades 7-8) is open to students who maintain a stellar academic record and demonstrate ideals of leadership, service, and dedication to the school community. Students are inducted toward the end of seventh grade and participate throughout their eighth grade year. Meetings are held as needed to plan and execute service projects for the community and school and to provide support and leadership for the rest of the student body. Mathletes (grades 7-8) are the best and brightest junior math students. They meet at specific times throughout the year to prepare for the Mu Alpha Theta competition held in February. While IC School does not have school-base scout troops such as Boy Scout, Girl Scout or Little Flower Girl (a Catholic-based club for girls in kindergarten and up) troops, we work cooperatively with local troop leaders and parent volunteers to ensure any interested child may participate. The Student Government determines and carries out service projects and other activities that will benefit the student body, faculty, and community of Immaculate Conception School. All members participate in any religious, social, or community service activity as determined by the principal, the student government sponsors, and the student government. Elections will be held after the midterm of the first nine weeks. Any seventh or eighth grade student that meets the eligibility requirements as stated in the IC Handbook may seek an office. Campaign managers are optional and chosen by the candidates. All student government members will meet occasionally during lunch recesses and after school. Student government members will be expected to coordinate and participate in activities with the Immaculate Conception CYM. These activities will be held outside of school hours several times a year. A student participating in any school sponsored extracurricular activity is required to fill out an Athletic Participation Consent Form (supplied by the Athletic Director), pay the school athletic fee and have a current physical on file. Eligibility requirements for participation in athletic programs can be found under the “Academic/Grading/Extracurricular” section of this handbook. Misrepresentation of IC School by any player, coach, or parent will be considered a serious offense and will be dealt with accordingly. Consequences will be determined by the principal and/or pastor. *IC does not hold tryouts for any sports. Everyone meeting eligibility requirements and desiring to participate may do so. With IC being a tobacco-free campus, Coaches are not to use ANY tobacco product during practices, games or at any time when around students. Tobacco use by a coach/assistant coach will be considered a serious offense and consequences will be determined by the principal and/or pastor. The primary function of a cheerleader member is to support, encourage, and to lead student body, team, and parents in school spirit and enthusiasm. The cheerleading squad is open to any girl entering the 5th through 8th grade. Captain/co-captain(s) for the cheerleading squad will be returning senior grade members for that squad when possible, and are chosen by a combination of tryouts, teacher recommendations, and a vote from all squad members. Cheerleaders are required to attend a specified cheerleading camp during the summer. Camp location is decided before the end of the school year. An information packet is sent home for cheerleading parents in April containing current camp cost, schedules and equipment ordering information. Traditionally, the cost of attending camp is approximately $175.00. Equipment costs for shoes, pompons, bags, socks, etc. are an additional expense associated with cheerleading. Fundraisers are held by the cheerleaders to defray the overall costs. Cheerleading members practice two days a week after school for one hour during the football season. Cheerleader members are expected to attend all football games (approximately 10). The school provides each cheerleader with a uniform. The cheerleader squad member is responsible for purchasing her own shoes, socks, ribbons, pompons, bloomers, sweatshirt, and specified practice uniforms (T-shirt and shorts). The prices are based on current catalog prices. Practice begins approximately two weeks before school opens in the fall and is conducted for approximately two hours Monday-Friday. Each student must provide everything except the game jersey. The approximate cost is $100.00-$150.00 for new equipment and $60.00-$80.00 for used equipment. * If a player misses practice because of detention, that player must perform extra agility drills or sprints. Other discipline is handled on a case-by-case basis. Volleyball is a very popular fall sport. Girls in grades 5-8 may participate. Practice times vary from coach to coach. Games are held at various gyms in Little Rock, North Little Rock, Hot Springs, Benton, and Marche. Boys and girls in grades 5-8 may participate. Practice schedules will be announced. Events include: shot put, discus, long jump, high jump, running races from 100–1600 maters, and hurdles. Track meets are held at Scott Field. Track & Field is a spring sport. Boys and girls in grades 5 – 8 may participate in Cross Country. Meets are held in various places including Burns Park. Cross Country is a fall sport. Boys and girls in grades 5–8 may participate in golf. The Parochial League Golf Team is run through the First Tee, and practices 3 days per week at the First Tee. The tournaments are held at the First Tee against other Catholic/ private schools. Golf is an excellent spring sport. Current Pareochial League Policies can be found elsewhere in this document. The Parochial League’s primary focus is to foster the academic and religious development of the students at all times. It provides an opportunity for all interested students to learn good sportsmanship and teamwork as well as improve in the basic skills of the sport. The athletic department will strive to encourage the active participation and individual efforts of each student, regardless of skill level. As a result of participating in the sport, the student/athlete should develop a respect for authority (coaches, officials, parents) and a respect for others (teammates, opposing teams). SECTION 1: The Parochial League sports are football, cheerleading, volleyball, golf, basketball, track, and cross country. SECTION 2: The sports programs are open to any child who wishes to participate as long as he/she is attending a parochial school or other member school and meets the academic and conduct requirements. SECTION 3: Schools are encouraged to have a sign posted near the entrance of the gym reminding all who enter to show good sportsmanship. Teams will pray together prior to each game/match. The home team is responsible for leading the prayer. SECTION 4: All athletic events need to be scheduled one night a week and on weekends. Schools may play more during the week for volleyball, tournaments, make-up games, and when the schedule must be made to accommodate more games. No games are to be scheduled to start after 8:00 P.M. on school nights. School nights are defined as Sunday, Monday, Tuesday, Wednesday, and Thursday. SECTION 5: All student athletes must attend one of the parochial schools or other member schools. The parochial and member schools are: Christ the King -- Little Rock, Our Lady of the Holy Souls -- Little Rock, St. Edward -- Little Rock, St. Theresa -- Little Rock, Christ Lutheran -- Little Rock, Immaculate Conception -- North Little Rock, Immaculate Heart of Mary -- North Little Rock, North Little Rock Catholic Academy -- North Little Rock, Our Lady of Fatima -- Benton, St. John -- Hot Springs, and The Anthony School -- Little Rock. SECTION 6: Schools shall not conduct tryouts. SECTION 7: Schools with multiple grade level teams are to divide these teams equally by skill level. This should be done at the 5th and 7th grade levels and more often if needed at the discretion of the principal and athletic director. SECTION 8: Team rosters for each sport must be turned into the Office of Catholic Schools at least two weeks prior to the beginning of that season. A waiver must be signed by the principal stating that a physical is on file at the school for each student dated within one year of the student’s beginning participation. SECTION 1: Athletic Program The athletic program is under the direct supervision of the school principal and overseen by the Superintendent of the Catholic Schools. Athletic fees paid to the Parochial League are to be sent to the Catholic Schools Office prior to league competition of that sport. The assessed fee to participate in the Parochial League will be determined at the first meeting of the year. Basketball referees are paid by the school hosting the game(s) at the rate of $24.00 per game. SECTION 2: Athletic Board The Parochial League Athletic Board will consist of the Superintendent of Catholic Schools and the principal and athletic director from each school. When a vote needs to be taken, each participating school principal will be granted one vote. The director of the officials is an ex-officio member. SECTION 3: Athletic Director The principal will choose an athletic director for his/her school. The athletic director is responsible for submitting all schedules to the principal. The principal and the athletic director are to attend the Parochial League Athletic Board meetings. SECTION 4: Coaches should be mindful of the physical safety of the students and not place any student in a position where serious injury may occur. Coaches must not physically or emotionally abuse any student who is under their supervision. Coaches should be aware that a student’s performance may be limited by their present physical and emotional developmental stage. Each student who is a member of the team should receive ample opportunity for playing in games on a regular basis. Persons who abuse these guidelines will lose the privilege of coaching in the Parochial League. All coaches and assistant coaches in Catholic schools must have completed the CMGConnect:Safe Environment online training, or record of VIRTUS, and have a background check completed by the Diocese of Little Rock before they will be allowed to coach. They must read and sign the Diocesan policy statement on Sexual Abuse of Minors and completed CMGConnect:Safe Environment online training. Coaches must be at least 18 years old. Coaches under 21 years of age must have an adult 21 years or older to supervise. This supervising coach must be listed on the roster of coaches. There shall always be at least 2 adults at all games and practices. SECTION 5: Officials The director of officials is hired by the league board. It is the responsibility of the director of officials to conduct a mandatory meeting with the officials to go over rules and regulations of the Parochial League. As officials are part of the team that administers games, we rely on them to keep control of each contest. They should be treated with respect by coaches, players, and fans. Any concerns regarding the officials should be directed first to the athletic director of the school, and the athletic director must share the concern with the principal and director of officials. The officials have the authority to eject coaches, players, and fans for violations of conduct. Each school is to have trained and qualified scorekeepers. No elementary students may be scorekeepers. The scorebook is the official record of all athletic events. The coach is to sign the book prior to the game to check the players’ numbers. The referees and the scorekeeper are to sign the book after the game is over. The official score books are to be kept at the schools. SECTION 6: Parents It is very important that parents function as role models for their children. Parents are strongly encouraged to attend games in which their children are participating, as an expression of parental concern for their child’s effort. Parent behavior at games shall exemplify the behavior expected of the child and must reflect positively on the Parochial League. Belligerent or demeaning comments or actions toward game officials, coaches, players, or other fans will result in ejection from the site. SECTION 7: Students are expected to show the same degree of respect and obedience to coaches as is expected of them in their relationship to classroom teachers. During the course of any sanctioned athletic activity, the student (player and fan), coaches, and parents are representatives of the Parochial League. Students shall not engage in any activity or exhibit any behavior that detracts from the goals or image of the Parochial League. Such behavior could result in ejection from the site. Rules for player participation will apply for both regular season and tournament play. No player who has reached age 12 by September 1st may play on the 5th grade team. No player who has reached age 13 by September 1st may play on the 6th grade team. No player who has reached age 14 by September 1st may play on the 7th grade team. No player who has reached age 15 by September 1st may play on the 8th grade team. If a student is academically ineligible, he/she may practice at the discretion of the school principal. If a student is absent from school due to illness or leaves early because of illness or unexcused absence he/she may not play in the game scheduled for that evening. Each school will set a time that students must be at school in the morning to participate in a game for that day unless there is an excused absence. No player may begin practice or continue to participate without a physical on file at the school that is less than a year old. All students must have on file a signed copy of the Diocesan Parental Permission form that includes proof of health insurance. Headbands and sweatbands must be white or similar in color to the jersey. Only one item is permitted on the head and the wrist. Sweatbands must be worn below the elbow and may be a maximum of 4 inches wide. Rubber or elastic bands may be used to control hair. Any other head decorations are prohibited. If a player wears a t-shirt under his/her jersey it must be the same color as the dominant color of the team jersey. If a team has two different colors of jerseys (light and dark) or reversible jerseys, when playing at home they will wear white (light) and dark when playing away. Jewelry is prohibited. A medical alert medal may be worn, but must be taped. A coach is to let the officials know before the game if any player is wearing a medical alert medal. If a player is bleeding, has an open wound, or has any amount of blood on his/her uniform he/she shall be directed to leave the game until the situation is corrected. If a player has an injury requiring a doctor’s attention, he/she must have a doctor’s permission before he/she may practice or play again. Quarter report card grades will be used to place a student on academic and conduct probation. Interim grades will be used for possible reinstatement. Interim conduct grades will be used to place a student on probation with the report card grade used for possible reinstatement. Changes for the roster dates will follow the official Catholic school calendar. Spring (Fourth) quarter academic grades or conduct grades will not affect fall sports eligibility. A = 90-100%, B = 80-89%, C = 70-79%, D 60-69%, F = Below 60%. A= 90-100%, B = 80-89%, C = 70-79%, D = 60-69%, F = Below 60%. Learning Disabilities: A diagnosed learning disability or handicapping condition is a condition that has been evaluated by a psychologist and/or psychological examiner and determined as severe enough to prevent a child from learning through traditional classroom instruction. If a student has been diagnosed with a learning disability the school principal may make an exception using the following guidelines to allow the student to participate in the Parochial League. Copies of test results and suggestions for educational modifications and/or MAP (modified academic plan) must be filed in the school office. A modified grading scale may be used in the student’s area(s) of disability. If there are areas of academics which are not affected by the particular diagnosed learning disability or handicapping condition, the academic eligibility standards for non-disabled students will apply. The principal, classroom teacher(s), parents/guardians, and student should be aware of the guidelines established in the modifications and/or MAP prior to its enactment. FAILURE TO OBSERVE ELIGIBLITY RULES WILL RESULT IN FORFEIT OF GAME(S) IN WHICH THE RULE(S) WERE VIOLATED. Games cannot be postponed for illness if a team has enough eligible players to start the game. School closures for inclement weather, sickness, etc. will automatically postpone games and practices. A decision regarding playing/postponing games on Saturday due to inclement weather, sickness, etc. will be made by the superintendent on the Friday evening prior to the Saturday games. The decision will be disseminated to principals and athletic directors at that time. Games will only be rescheduled for church and school activities that were not scheduled prior to the season. Pep rallies are limited to a maximum of four for the school year. Teams are to be at the game site, dressed and ready to play 15 minutes prior to their scheduled game time. Girls cannot play on boys’ teams, and boys cannot play on girls’ teams. Any school whose team forfeits a game will be responsible for paying the officials’ fees. They will reimburse the home school or the Parochial League. 5th and 6th grade boys and all girls teams will use the 28.5 inch ball. The free throw line for the 5th grade boys and girls will be twelve feet. The regulation free throw lane will be used for the three (3) second call. The 5th and 6th grade boys/girls divisions will play five (5) minute quarters. The 7th and 8th grade boys/girls divisions will play six (6) minute quarters. All overtime periods will be 2 minutes in length. All post-season tournaments will be single elimination. If a player is injured and must come out in his/her first quarter of play he/she may not re-enter that quarter unless it is on the next stoppage of the clock. If they do not re-enter immediately, they must still fulfill their quarter requirement the next time they enter. The 5th grade boys/girls divisions may press the last two (2) minutes and the entire overtime period of the game. The 6th grade boys/girls division may press the second half of the game. The 7th and 8th grade boys/girls divisions may press at any time. A team that has a fifteen (15) point advantage may not press the opposing team. PRESS is defined as guarding closely beyond the three-point line as well as any full court defense or half court trapping defense. The spirit of this rule is to allow the team to get across the 10-second line. If there is a 30-point advantage in the 4th quarter the clock will run continuously. There can only be 2 non-players (coaches) sitting on the bench. Ineligible players can sit on the bench with the team. Playing down is not allowed unless approved by the Superintendent of Catholic Schools. If needed a team may play up players from the grade below to have a total of 7 players for a single grade team. The quarter rule for playing will apply. Schools which field more than one (1) grade level team must have a minimum of 6 grade level players on the roster before being allowed to play up additional players. Schools that need 4th graders to make a 5th grade team, girls and/or boys, must offer all 4th graders of that gender the opportunity to play. A player is allowed to play a maximum of two (2) games per night. If any team fails to show for a scheduled game, by game time, the game is a forfeit. If both teams fail to show, both teams will receive losses. Any school whose team forfeits a basketball game will be responsible for paying the referees fees (they will reimburse the home gym). First and second place trophies will be awarded for league play and a traveling trophy will be awarded for postseason tournament play. All play and penalties will be governed by the NFHS rules provided that there is not a league rule that supersedes it. Volleyball games will be scheduled at 6:00, 6:45, and 7:30 during the week. Volleyball games can be played two weeknights when necessary. The service area will extend 5 feet into the court for the 5th and 6th grade division. The postseason tournament will be single elimination. Rally scoring will be used at all grade levels. A match will consist of winning the best 2 out of 3 games. The first 2 games will be played to 25 points. The third game to 15 points. A team must win a game by 2 points. All players must wear kneepads. A grade level team may play up players from the grade below to have no more than 7 players. The 5th and 6th grade teams will use the lightweight volleyball. In the interest of safety, it will not be required that each child be played a minimum amount of time. A smaller student should not be played against a larger student. Coaches should try to play each player an equal amount of time. Any player who weighs more than 160 lbs. without pads may not line up in the backfield except as a punter in a punting situation. There will be 3 time outs per half. The quarter will be 7 minutes in length, stopping per NFHS rules. Half time will be 10 minutes. Four referees will be used, but play can start with only two present. The home team will be responsible for the opening prayer and the chain gang. During the game the players and coaches on the sidelines must stay between their twenty and forty yard lines. Should the football season end with a tie, the tie breaker will be the fewest points scored upon a team will be higher ranked team. Any elementary or secondary school with a cheerleading program must have a qualified coach to supervise. If the cheerleading program does any type of acrobatics, pyramids, or tumbling skills the elementary school must follow the Novice rules and regulations from the National Cheerleading Association. The following guidelines are to be used for these elementary school cheering squads. Cheerleading squads should be placed under the direction of a qualified and knowledgeable advisor or coach. To be a qualified advisor or coach one should receive the Spirit Safety Certification from the AACCA on line at http://www.nfhslearn.com/Courses.aspx. Advisors/coaches should recognize a squad’s particular ability level and should limit the squad’s activities accordingly. All cheerleaders should receive proper training before attempting any form of cheerleading gymnastics (tumbling, partner stunts, pyramids and jumps). Stretching exercises must be done prior to all stunts. All jewelry is prohibited during participation. SECTION 5: Quiz Bowl The Arkansas Quiz Bowl Rules of Competition will be followed. SECTION 1: Consequence #1 (C1)--Forfeit of game or games that the rule violated. SECTION 2: Consequence #2 (C2)--The team that violated the rule will continue playing games but will not be eligible for any pre/postseason tournaments. SECTION 3: Consequence #3 (C3)--The member of the team that violated the rule will be dismissed from the league and put on one-year probation. That is, not play any games for one year. SECTION 4: Consequence #4--If a player, coach, or fan is ejected from a game for a violation he/she cannot attend that team’s next Parochial League game. This must be reported to the principal and the principal will enforce. If the ejected coach, player, or fan is from the visiting team it is the home team principal’s responsibility to contact the visiting team’s principal to make sure the rule is enforced. If there is a second offense they will not be allowed to return for the remainder of the season. If anyone puts hands on an official, in a hostile manner, this person will be banned from athletic events for one calendar year. A protest will be considered for any league game where there was an alleged misapplication of a playing rule. Within two (2) business days, the coach must submit in writing to his/her athletic director, the date, time, place, opponent, name of the official, the rule under which the protest is made, and the conditions and essential facts involved in the protest. The athletic director will present this to his/her principal. If the principal deems the protest to be valid, the principal will notify the principal of the school on which the protest was filed. The protest signed by the principal and the athletic director and a fee of $25.00 must be submitted to the Office of Catholic Schools within 4 business days of the game in question. A non-partisan committee appointed by the superintendent will review the protest and a decision will be communicated to both principals within five business days of receiving the protest. If coaches pick and choose players to play in an invitational tournament the players shall not wear the school uniforms. Even though invitational tournaments are not Parochial League sponsored and the Parochial League rules do not apply, coaches are expected to conduct themselves with the same decorum as required in the Parochial League and are encouraged to follow playing time rules. IC is a tobacco-free campus. Tobacco products (including but not limited to: cigarettes, smokeless tobacco, cigars, pipes and dissolvable tobacco) are not to be used on campus, around the students, or at any school sponsored activity. The Fair Share Hours Program (FSHP) has been established in an effort to: (1) provide services and support to enrich our educational programs for our children; (2) ensure these responsibilities are uniformly distributed and shared among the school families; (3) offer families opportunities to enrich their interactions with other school parents, their children’s teachers and friends. CLARIFICATIONS: The following clarifications are made to help with any disparities and to make this program uniform and equitable to all. 1. PLEASE NOTE: We define Single-parent status to include widows/widowers and/or a parent that has no spouse or ex-spouse involved in the responsibility, legality, education, social, and/or financial well-being of the student. This status does not include students of divorced and/or combined families. 2. Volunteer activities are to be school related. Some activities here on campus will not count towards your Fair Share hours, e.g., Boy/Girl Scouts, some Men’s club activities, VBS, CYM activities, Sonfest (except the PTO baskets), etc. If there is a question about whether an activity qualifes as school related, please contact the school office. 3. Thank you for all your services and your support of this program. It is a great testament that so many families support this program and interact within our school community. CHOOSE A PARTICIPATION OPTION: FSHP offers school families two options for participation each year. 2. Make a monetary payment in the amount of $200 for 2-parent families; $100 for single-parent families. • If you select option B to participate through activities that benefit IC, your contribution will be measured by the number of hours of service performed. Each family helps by fulfilling a minimum of 20 hours per school year. Single-parent families will fulfill a minimum of 10 hours per school year. Attending Preschool only: These families are required to fulfill 10 hours or, if a single parent, 5 hours per school year. Only parents, legal guardians, siblings of the student over the age of 19, or other relatives in the immediate family may provide services creditable toward the FSHP fulfillment. If you have not fulfilled the 20 hour/10 hour participation level, you will be required to pay this prior to receiving student report card and standardized testing results or prior to us forwarding records to any other school. • Some volunteer positions will be published during Back2School Daze. Look through all the possibilities, decide the areas in which you’d like to help, and sign up with the PTO representative. • If you choose the monetary payment option in lieu of service, the payment, billed in two installments (September and January), is $200 for 2 parent families; $100 for single-parent families. These payments will be drawn from your FACTS account on your tuition deduction date. If you prefer, a single payment for the full amount may be made in September. • Each month please report the hours you worked through RenWeb. All hours must be recorded by mid-May. The volunteer in our school is a valued member of our school community. You have the right to be treated with respect due any adult staff member, whether paid or not. You have the right to the tools, resources, and information necessary to perform the tasks to which you are assigned. Be responsible and safe--always put children first. Ask for help--don’t suffer in silence! Share your experience with others and encourage new volunteers. Try to replace yourself when you move on and help train the new person. Be prepared. Communicate with teachers and coordinators ahead of time. Be on time. If you can’t make it, let someone know. If necessary (e.g. in the Library), try to find a substitute. Act as a good role model for the children. Always sign in and out at the school office. It is important for staff to know that you are in the building and it makes it easier to locate you in an emergency. Always wear a “Visitor” badge. As a courtesy to others, please turn off cell phones while in the school building. when not in a classroom, quietly exit the building and remain at a safe distance until notified that it is safe to return. Procedures for other emergency drills are located in the “Crisis Management Guides” located in each classroom. If you are taking food into school, please check with the class teacher or school nurse because some food may be inappropriate for children with food allergies. Never dispense medication to a student. All medications should be taken to the office and dispensed by the school nurse or office personnel. To make sure that students, staff and families feel comfortable, we all need to respect each other’s privacy. Volunteers must be especially careful to honor confidentiality. Breaching confidentiality can be hurtful to children, their families and the staff. It can also harm the good reputation our IC volunteer parents have earned over the years. To help, here are some sample issues that can arise: “Wasn’t it cute when John . . .” No matter how innocent, cute, funny or charming a classroom event may be, it is not okay to repeat stories about students. What happens in the classroom stays in the classroom. When parents ask you questions . . . Many parents are tempted to ask you about how their children behave at school. This is especially likely if you are friends outside school. It is not okay to put volunteers in this awkward position. Don’t ask! Don’t tell! If parents do have concerns, direct them to talk to the class teacher. When you see or overhear something . . . As a volunteer, you might see or hear things from staff or students that they would not want to have repeated outside the school. What happens in the classroom (or the hall, or the gym) stays at school. If you have concerns about something you see or hear, please talk to the class teacher or Principal if appropriate. When students tell you about their family, pet, vacation, etc. . . .As students become comfortable working with you, they might decide to share something personal. You need to keep this information private, even if you know the child and their family outside of school. When you have a concern . . . If a student tells you something that causes you concern, tell the classroom teacher. If you observe something that troubles you, tell the classroom teacher. The teacher is in the best position to deal with the issue appropriately. Approach: Be professional and be positive! Strive to give each child the best you can and know that other IC volunteers do the same when working with your child. Respect each child as an individual. Respect your co-workers and all school employees. If working in your child’s classroom, try not to single them out for attention as this may make them uncomfortable. Don’t distract teachers while they are teaching. If you have questions wait until there is an appropriate moment. Honor your commitments and be on time. Try to make any criticism constructive. **Remember your time and energy is helping to make Immaculate Conception a great place to learn. Immaculate Conception’s Before/After School Care Program (ASC) is dedicated to providing a quality, Christian, safe and enriching environment for your child(ren) after the school day has ended. We recognize the rights of individuals as children of God deserving honor and respect, and work toward the following goals and objectives with the involvement and cooperation of the child’s parents or guardians. To provide a safe environment for all participants involved in this program at the beginning and/or end of the school day where they may do homework and relax until they return home. Admission is open to all IC students upon completion of an ASC Enrollment form/financial agreement. All fees are drafted from your checking or savings account. Enrollment forms are available on our website (www.icsnlr.org/For Parents/After School Care) and from the school office. Current rates and fees are available on our website (http://www.icsnlr.org/student-life/extended-care.cfm) and from the school office. Statement of balance due must be satisfied within ten (10) day’s notice. Denial of further ASC attendance when an unpaid account is past due. Extended Care is available every school day, including regularly scheduled early-out days. Extended care is not available the first Friday in May (noon dismissal) or on the last day of school. Extended Care is not available if school is dismissed early due to inclement weather. Extended Care is from dismissal until 5:45. Late charges ($1 per minute) are incurred after 5:45. Charges may increase for students repetitively picked up after 5:45. ASC follows the IC School Handbook. The ultimate goal of IC’s discipline system is to teach students to demonstrate responsibility for their own behavior, as well as to teach that there are consequences for improper actions. If corrective measures are needed, the staff shall first use constructive and positive measures. If inappropriate behavior continues. discipline measures may involve loss of conduct points and/or detention. If a parent has a question or concern regarding ASC, please email or phone the Extended Care Coordinator at childcare@icsnlr.org or 501-835-0771. Serious or continuous disciplinary problems will be referred to the principal. Parents will be notified of infractions and of the disciplinary action taken. If the student cannot be helped by the disciplinary action, the principal may follow the procedure for suspension or expulsion for the Extended Care program as outlined in the Diocesan handbook. The administration reserves the right to waive and/or deviate from any and all disciplinary regulations for just cause at his/her discretion. Statement of Confidentiality: ASC staff will keep confidential information entrusted to them as long as no one’s life, health, or safety is at stake. Immaculate Conception preschool is committed to the teaching of Catholic doctrines and Christian values. It is dedicated to providing quality academic programs integrated with religious truth and value. The administration and faculty pledge to encourage the appreciation of learning, and seek to develop in each student a love for God and Church, a respect for person, and thirst for knowledge. A child must be 3 years of age on or before September 1 to enter the 3-year-old class. A child must be 4 years of age on or before September 1 to enter the 4-year-old class. Maximum size of the 3-year-old class is 18 students. Maximum size of the 4-year-old class is 22 students. All holidays, early closing, etc. will fall under the school calendar and guidelines. The building will open at 7:15 am and the school day will end at 3:10 pm.This means that your child needs to be picked up by this time. Preschool wear uniforms and follow the IC Uniform policy. Conferences will be available on request by the parents or as deemed necessary by the teacher. Corporal punishment is contrary to Diocesan policy and will not be used as a means of control. Discipline shall be consistent and individualized for each child and directed toward teaching the child acceptable behavior and self-control (e.g., time-out at the length of one minute per year of the child's age and patient discussion between the child and teacher about misconduct). The preschool follows the state guidelines for all required immunizations. Any student having or suspected of having a communicable disease (as defined in the Arkansas Department of Health Rules and Regulations pertaining to communicable disease) will be excluded from school for the period of time designated in the same guidelines. It is the responsibility of the teacher, teacher assistant and aide to report a suspected child abuse or neglect of a child to the county SCAN or social services office. The state-wide Child Abuse “Hotline” number is 800-482-5964. Children are subject to be interviewed by licensing staff, by child services investigators, or by law enforcement officials for investigative purposes and/or determining compliance with licensing requirements. Routine emergency drills shall be practiced monthly, and staff shall be thoroughly familiar with safety drill procedures. A daily sign in sheet will be provided and must be signed with the time noted upon arrival and departure for the purpose of protecting the child's safety. Because the preschool is licensed to operate by the Arkansas Department of Human Services, certain state guidelines must be met pertaining to what the children's lunches contain. IC offers a hot lunch program that meets all state guidelines and can be purchased through the school. If you choose to send a lunch to school with your child, we ask that the lunch contain food from each of the four basic food groups. A fruit and vegetable must be included to meet state requirements. Any lunch credits under $20 remaining at the end of the year will be refunded only upon written request. The IC Principal will select the teacher and aide. The Principal will be responsible for background checks to determine the employee's suitability for childcare. This includes contacting references and checking employment records and criminal background checks. The teacher shall be in authority while the preschool is in session and will plan the teaching program following the objectives established by the IC Pastor and Principal. IC school is bound by the The Diocese of Little Rock Policies Manuals for Catholic Schools that includes but is not limited to the following policies. Catholic Schools Policy Manual can be viewed in its entirety at http://www.dolr.org/schools/policy-manual.